The "Play Fair" campaign is one of the biggest ever mobilisations against abusive labour conditions. Hundreds of organisations and many top athletes have participated in over 35 countries and more than half a million signatures have been collected in support of the campaign before the Olympic Games in Athens. Over 500 local campaign events have been organised and this has helped contribute to extensive coverage on television, radio and in the press all over the world. Spectacular events, demonstrations and actions which we don't want to forget and which are an inspiration to all of us. Find photos, personal stories and campaign accounts under the section "Actions, Stories & Photo's" By no means did we succeed in bringing all the activities together on this site, but it certainly will give you the idea on what went on! This site has all the background information on the companies, labour conditions and everything else you want to know about the Olympics campaign and what has happened so far. Campaign organisers have prepared a summary of the achievements and disappointments of the campaign until Athens which concludes: "We have pushed the sportswear industry to begin discussing an industry-wide solution. We hope that they seriously commit to this process and we will be publicly reporting on progress. The IOC's refusal to engage seriously in solving this problem is intensely disappointing, but we will continue to campaign to ensure that the Olympic ideal extends to the women and men who make the world's sportswear." Of course activities continue! Updates will be added to this site regularly. We will continue pushing the sportswear sector, the companies and the Olympic family to take responsibility, up until Turin, Beijing, Vancouver and London! Oxfam, Clean Clothes Campaign and Global Unions launch an international campaign on workers rights in the sportswear industry at a London Sports Stadium with painted athletes. 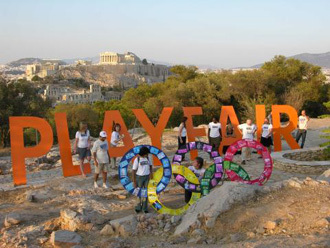 On August 11 in Athens an event celebrating the "Play Fair" campaign was held on a hilltop overlooking the Acropolis. Photos from campaign events were attached to 2-metre high Olympic rings in front of giant letters which spelled the words "Play Fair". The event honoured the great events, actions and demonstrations that have been organised around the world for the Play Fair campaign up until now.